Its that time again when we sit back and reflect of a full on year of Motor Sport Photography. A massive thank you goes out to all the Drivers, Teams , Clubs, Fans, Media outlets for supporting Automotive Event Images throughout 2018. 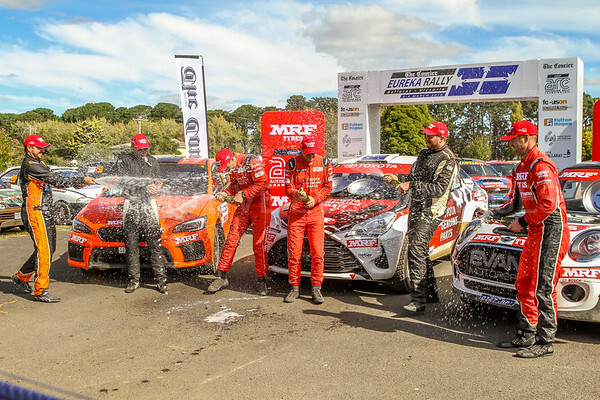 Cams Australian Rally Championships - Eureka Rally. Podium Celebrations - ARC- Podium 2018. J.McCarthy, H.Bates, M.Potter, S.Glenney, B.Searcy, E.Evans. 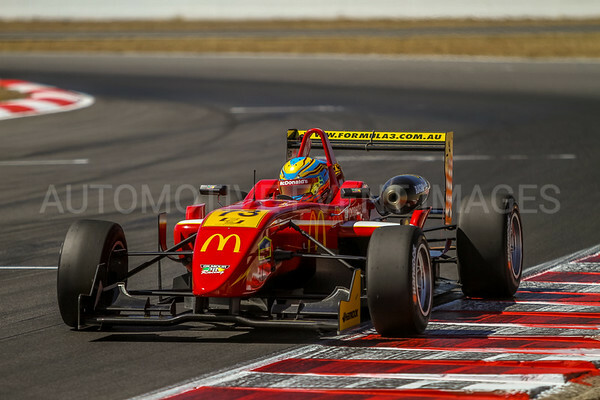 We just love this shot of Camerson Shields driving his Dallara F308/11 coming on to pit straight during race one of the Australian Formula 3 Premier Series. It was a very hard decision to leave out several images from this event which also featured the TA2 Perfomax Cup with a dozen Ford Mustangs and Chevrolet Camaro's thundering around the track...Quiet a sight and sound..
Monza Park Ballarat 7/8 April 2018. 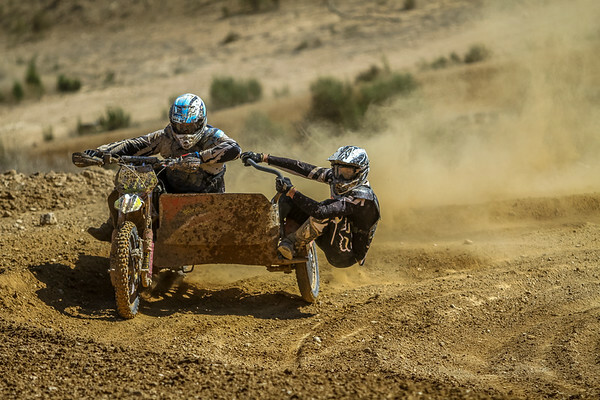 We cant say enough about all the riders from the event, the speed and endurance that they display and utter bravery was a pleasure to watch and to photography the event..
Picture - Russell Bailey and Brendan Noble in action..
Again all the riders at the meeting showed no fear making the jumps and turns at full speed in dry dusty conditions. 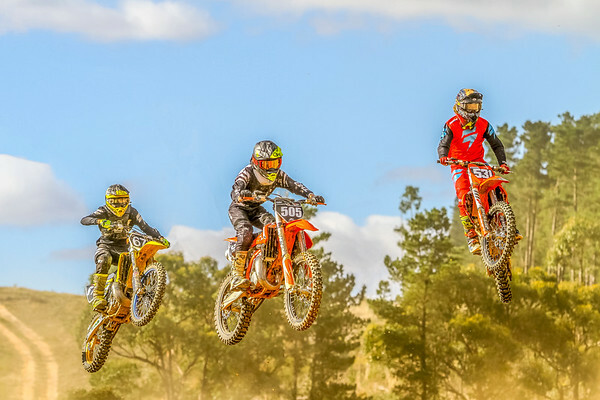 This Images, is one I was trying for a while in order to get all the riders in focus at once whilst in mid air and after some trial and error we managed a few great shots for the guys.. This Images is from the Senior Lites C Races and features riders #505 Tyler Smith / #531 Harli Brice / #674 Mathew Jones..
Winton Super Sprint Round Six races 13 & 14 of the Virgin Australian Supercars Championships - 18th - 20th May 2018. 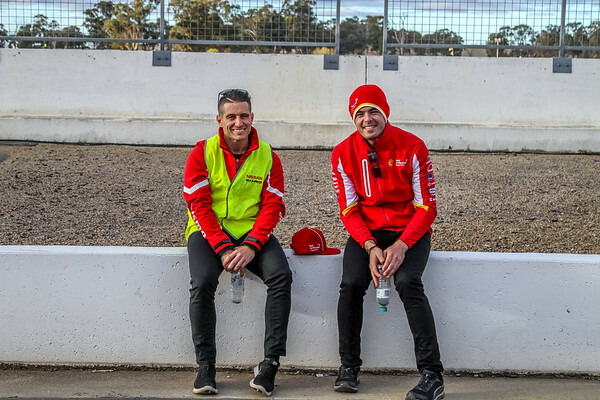 Another on of our favourites is from the Winton Super Sprint when we went to congratulate Nissan Driver Michael Caruso on his 150th championship round start in Pit Lane and caught up with Shell V Power Racing Team driver Scott Mc Laughlin..we had a chat with the boys and even managed a few smiles for the camera..
One of our great action shots is the start of race 13 of the Virgin Australia Supercars Championship when #17 Scott McLaughlin ( shell V Power Racing team ) leading the field around turn one of the winton track. 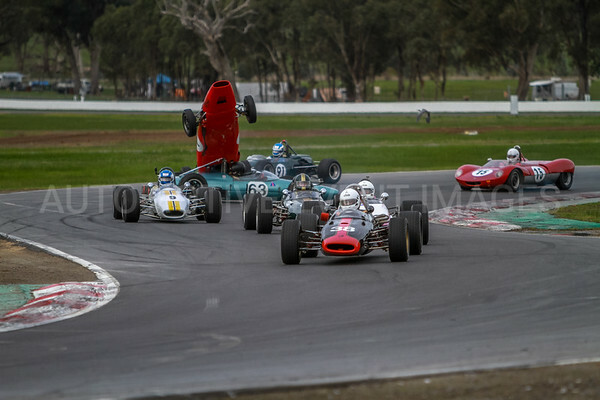 Danny Ciarma almost flips his 1962 Formula Junior lynx during the Group M and O event.Every one walked away ok but it was a huge crash and our cameras just happened to capture it unfolding.. The Team from Automotive Event Images Headed up to Winton Motor Raceway for Round Six of the ASBK - Australian Superbike Championship. ASBK Race Two - #27 Jamie Stauffer slides his Ducati Penigale R on turn two during Race two of Round six of the ASBK. 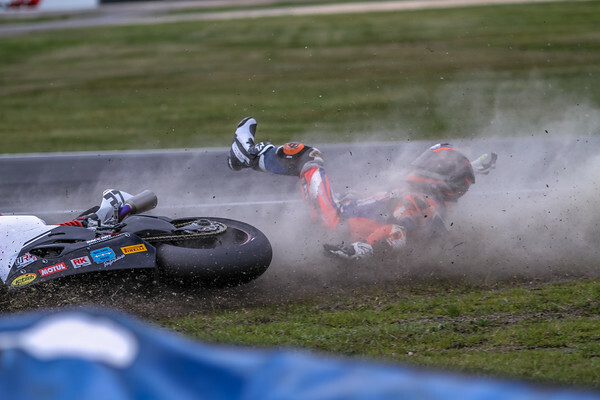 Turn Two at Winton always provides us with some amazing images and we always manage to be in the right spot at the right time.. Pit lane No.9 David Reynolds and Co Driver Luke Youlden racing for Erebus Motorsport V8 driving the Holden Commodore ZB. 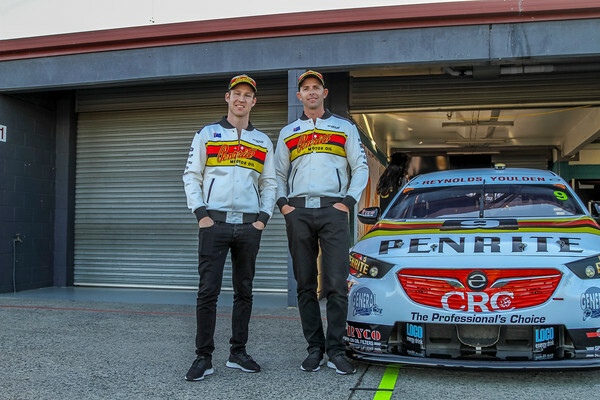 One of our favourite supercars shots of David and Luke dressed in their retro outfits and posing in front of the Retro Livery of the Erebus Holden ZB. Rabble.Club Sandown 500 ( Retro Round - Round 1 Piratek Enduro Cup )Round 12 Race 24 of the Virgin Australian Supercars Championship 14-16 September 2018. No. 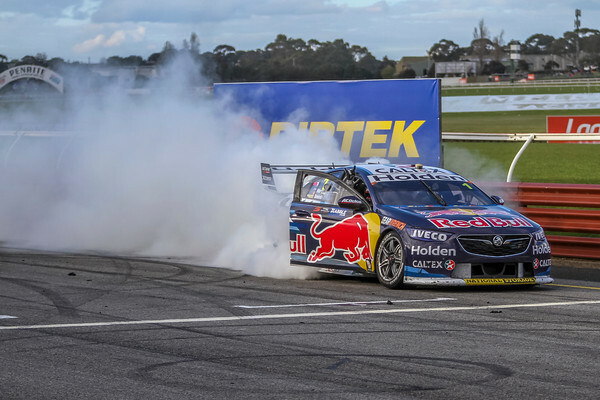 1 Jamie Whincup racing for Triple Eight Race Engineering driving his Holden Commodore ZB celebrating with a burnout after Victory in Race 24 of the Virgin Australia Supercars Championship. 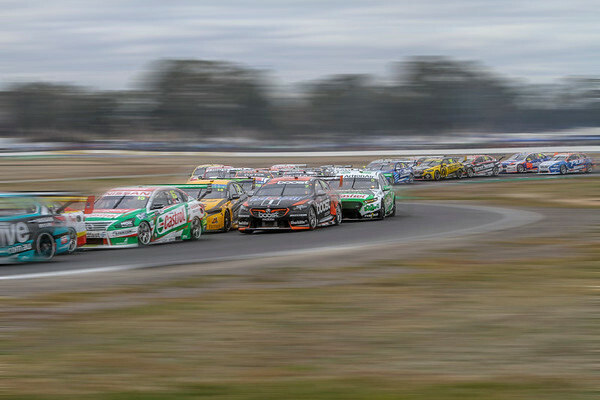 The Rolland Dane owned Triple Eight Race Engineering Racing team has clean swept the Rabble.Club Sandown 500, round 12, race 24 of the 2018 Virgin Australia V8 Supercars Championship with Jamie Whincup and Co Driver Paul Dumbrell racing for the Red Bull Holden racing team convincing winners of the 500 Kilometre race, Whincup beat home team mates No. 97 Shane Van Gisbergen and Co Driver Earl Bamber who finished second in the race and No.888 Craig Lowndes and Co Driver Steven Richards completed the all Holden Podium. Thirteen year old Alex Mee has today made treasured memories at Mildura’s Sunset Strip Dragway thanks to the efforts of a dedicated group. 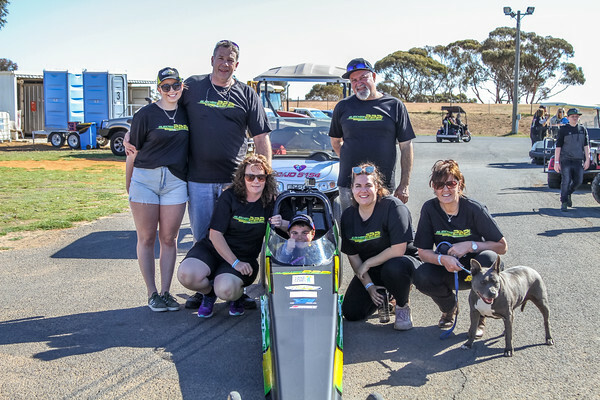 Growing up in a drag racing family, Alex has always dreamt of racing himself however after being diagnosed with the terminal disease, Duchenne Muscular Dystrophy (DMD), it appeared this dream would never come true. However, today Alex realised his dream of travelling the drag strip, with the car-loving youngster able to ride in a specially-liviried Junior Dragster as it was pushed by a golf cart to the start line and then down the drag strip* while his family, friends and racing community watched on decked out in special 'Alex Mee' race gear. When we were asked to photograph young Alex during his pass down the 1/8 Mile track we were humbled and thrilled that we could document the occasion in order to promote awareness of the disorder and to help the family by providing some images from the occasion as a keepsake.It was a pleasure to meet Alex and his Family. Automotive Event Images donated all images of Alex during the event to the family in order to promote the disorder. We were thrilled when we were asked to photograph the Junior Dragsters Racers at the track after the day one action of racing. 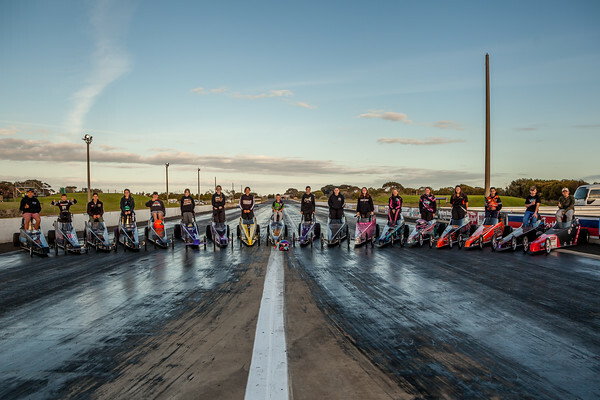 The Young Junior Dragsters, their teams and their families are trying to promote the Juniors Racing Series and show some of the sport in the light of fun and safe competitive racing that is enjoyed by all racers, team and supporters. Currently the Junior dragsters are not permitted to race in the state of Western Australia after an accident a year ago suspended all racing events for the Juniors by the WA government.. We attend a vast amount of Drag racing events and give the upmost support to the teams and families of the Junior Dragsters..and were happy to assist all involved in the lobbying to the Minister for Sport and Recreation the Hon Mick Murray MLA to get the ban lifted.